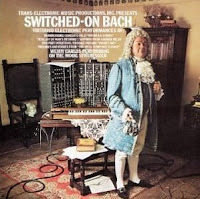 In Wendy Carlos’ case, the use of the synthesizer to interpret a Baroque composer such as Bach is, of course, avant-garde in its impulse, but if one pauses to consider the synthesizer as a fetish object, her identification with the Moog, a machine whose operation rested upon its capacity to be re-wired--think of the endless plugging and unplugging of patch cables across a bewildering array of panels, as well as the tweaking of many dozens of knobs--in order to produce a different sound effect, is not an inappropriate object of identification for a transsexual, since gender is indeed in part a social performance--an effect. (Derrida on the fetish: “the projection operates in the choice rather than in the analysis of the model.”) In addition, engineers' coding of wire connections as "male" and "female" is highly suggestive as well. How appropriate, then--and I remark upon this without irony or sarcasm—that Switched-On Bach was presented by “Trans-Electronic Music Productions.” It is also interesting to note that, as revealed by Pinch and Trocco's interview with Bernie Krause, the eccentric Paul Beaver--an early synthesist pioneer who died prematurely in 1975, and whose career has been largely overlooked in favor of Wendy Carlos' career--was bisexual, yet another provocative association with the Moog synthesizer, and those drawn to its mystery and singularity.